Shasta daisy is a herbaceous perennial ornamental, originally native to the meadows, grasslands and alpine areas of Europe. It has leafy clumps of foliage that give rise to many tall, small-leaved stems topped with white daisy-like flowers in summer. 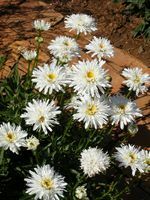 Leucanthemum maximum prefers regular moisture and well-drained, neutral to alkaline soil in sun. Its blooms are attractive to numerous insects including bees and butterflies, and it make excellent, long-lived cut flowers.